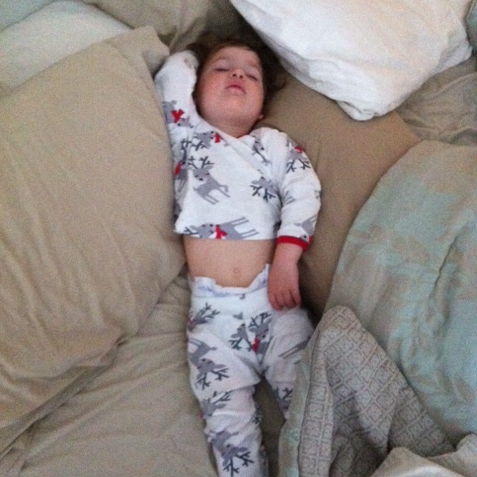 Passed out in our bed, an all-too-common occurrence lately. Parents with infants know all too well the fun of sleep training. It can often times be a tedious task to get your baby to sleep through the night, but most times, it works out and your little one gets into a nice pattern of sleep–so do you, as parents. When Sophia was an infant, we were able to sleep train her by eight weeks old, and then we were able to come up with a nice schedule for ourselves, as well. I wish that re-training your toddler to sleep through the night, or go to bed by themselves for that matter, was as easy as it was with infants. For a few months now, Sophia hasn’t wanted to go to sleep on her own. Every night one of us (usually me) would take her to bed and inevitably wind up laying next to her in her crib converted to a toddler bed. Now, I don’t know about you, but trying to squeeze into a bed sized for a toddler, night-after-night isn’t exactly my idea of an enjoyable evening. We’ve since gotten Sophia an actual toddler bed, although it, too, isn’t a comfy place to lay for an extended period of time. 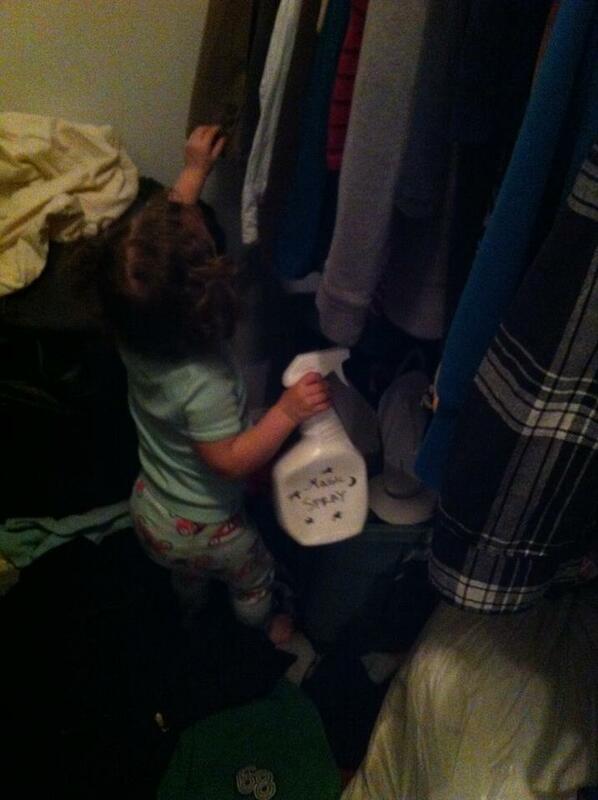 Spraying our closet for monsters with her Monster Spray. The sleep issues started when one of the teacher’s at her daycare pretended to be a monster and scare the toddlers. Yes, THAT sounds like a spectacular idea! Let’s scare the kids and make them think there are monsters around. Nothing about that sounds like a bad idea, whatsoever! And so began the “monsters in my room” phase. After taking some advice from friends, I created a bottle of “Magic Spray” that Sophia could take around the house and use to get rid of any monsters she thought were in the house. Eventually she got over the fear of monsters, but that didn’t solve the going to bed on her own issue. I reached out to fellow parenting blogger Nina at sleepingshouldbeeasy.com to see if she had any advice on the topic. She offered me some suggestions that have been helpful. She also wrote a post offering tips for the issue, which you can read in the link above. I wish I could report that things have gotten better, but so far, they haven’t. I’ve tried so many different things, but so far, nothing has worked. Sarah and I are really hoping that we’ll be able to get her back to sleeping on her own by the time the baby arrives in late August. Any advice, tips, or tricks are more than welcome! And as always, like, share, and comment here or on the Papa Brownie Facebook page!